Wednesday, Oct. 3, 1888 Earth frozen this morn- but warmer than yesterday P.M. tho' only 58° & quite pleasant. Others as well, & Charlotte better tho' jaw sore & tender of course, but busy as ever at usual duties, putting up of fruit still included. Mr & Mrs Wedgwood left for Hawkeye to visit Millie Adams & short rest. Quite as well self tho' no extra strength, & taking it easy with regular routine, comc'd "undershirt" for knitting. 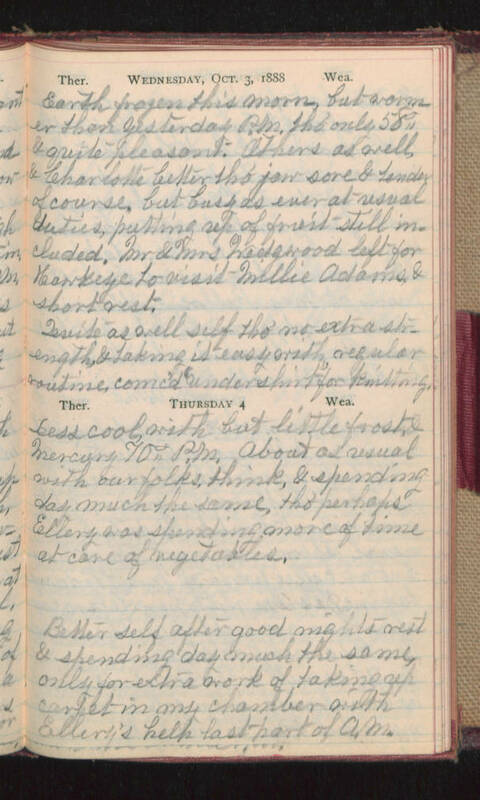 Thursday 4 Less cool, with but little frost, & Mercury 70° P.M. About as usual with our folks, think, & spending day much the same, tho' perhaps Ellery was spending more of time at care of vegetables. Better self after good nights rest & spending day much the same, only for extra work of taking up carpet in my chamber with Ellery's help last part of A.M.